Arriving in California in 1839, John A. Sutter applied for a land grant from the Mexican government and two years later received almost 50,000 acres in what is now present-day Sacramento. Envisioning an agricultural utopia, Sutter began to build a settlement, which he called New Helvetia, or “New Switzerland.” And to protect his new property, he built what became known as Sutter’s Fort. Employing members of the Miwok, Maidu, and Kanakas tribes, the fort included 18-foot walls which surrounding shops, houses, mills, and craftsmen. Surrounding the fort the land was filled with crops such as grapes and wheat, along with vast herds of cattle. 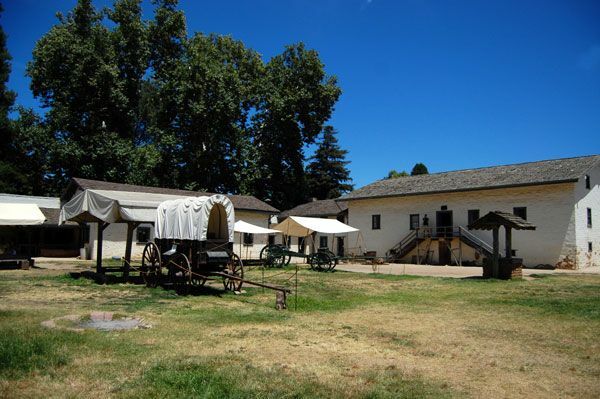 Completed about 1843 and strategically situated on the Oregon-California Trail and near the inland waterways from San Francisco, it soon became the primary destination for most California-bound immigrants, including the ill-fated Donner Party who Sutter attempted to rescue. But, for John Sutter, his life was to come crashing down around him when James Marshall discovered gold at Sutter’s Mill in January 1848. As word quickly spread, some 80,000 miners flooded the area, extending up and down the length of the Sacramento Valley and overrunning Sutter’s domain. Sutter’s employees also joined the Gold Rush and he was unable to protect his property. In no time, his sheep and cattle were stolen, his land was occupied by squatters and he lost possession of the fort. By the 1850s, all that was left of Sutter’s Fort was the central building and by 1860, its outer walls and rooms lay in ruin. Ironically, neither John Sutter nor James Marshall ever profited from the discovery that should have made them independently wealthy. In 1890, the State of California acquired the site and began restoration, which was completed in 1893. Sutter’s Fort became a part of the California State Park System in 1947 and today stands as the oldest restored Fort in the United States.Of the original buildings, the two-story central structure, made of adobe and oak, remains preserved and provides exhibits and living history interpretive services.